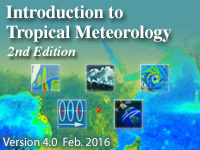 This chapter presents an overview of the major cycles dominating intraseasonal and interannual variability in the tropics. Characteristic atmospheric and oceanic patterns for each oscillation are presented and methods for tracking the evolution of these cycles are described. Observations and conceptual models of equatorial waves are presented. Classical solutions for equatorial waves are outlined and the effects of moisture on the expression of these waves are discussed. Since the tropics are not an isolated region of the globe, the impacts of these cycles on higher latitudes are also explored. In view of the recent interest on the effects of long-term climate variability, the potential role of multidecadal oscillations in modulating these shorter cycles is discussed. Expand some of the topics to make it easier for someone with less advanced knowledge of the tropics to understand, otherwise excellent lesson and great explanations. I learned a lot from this course.